Before that here is the definition of the term which we will use throughout this post. The quality or condition of being hard. It is a measure of the resistance to localized plastic deformation. The Rockwell hardness is nothing but value for a particular material obtained using a Rockwell hardness tester. This value is denoted as 'HR'. The notation 'HR' is read as hardness according to Rockwell. The process was invented by Hugh M. Rockwell and Stanley P. Rockwell. Prior to the invention, there exist some machines but there was a need for a non-destructive method. It is a technique to inspect and test a sample without any damage so that it can be used for the further process if found OK. The first machine was used to experiment with steel bearing races. A technique used to calculate the hardness of a material. A way to find out HRC value. It is a differential depth procedure. The principle theory is similar everywhere. The part is kept below the diamond indenter at specified space on the machine. A minor load (approx 3kgf) is applied to the object. 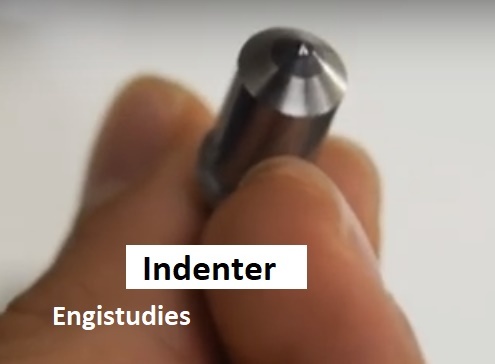 The indenter is held in this position for a predetermined time. The scale which follows the movement of the indenter is set to the datum position. The depth of indentation is measured from the reading on the scale. Now, the load is increased up to the major load (approx 150kgf). After a specific dwell time, again the reading on the scale is noted down. The load is released slowly and again bought to the minor load value. Similar to step 1, the load is kept for some time and depth value is noted. The load is released fully. 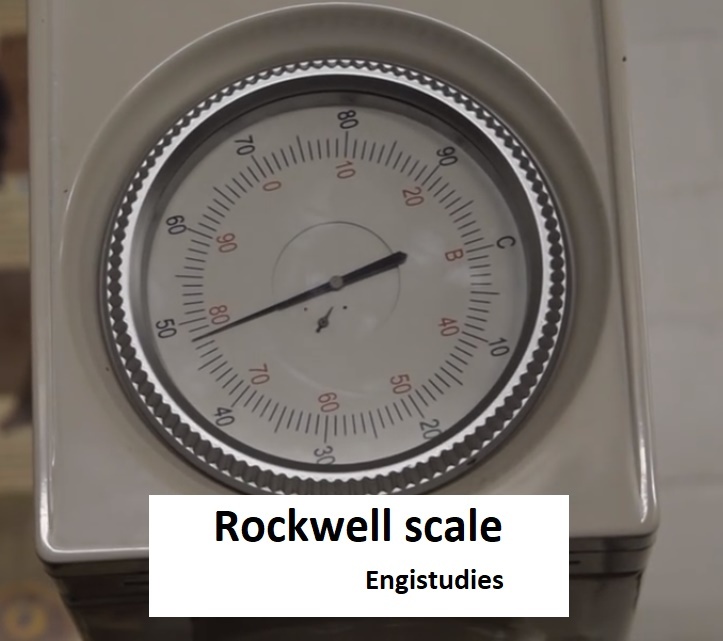 There are 30 different types of Rockwell scales which use different indenters and force value. The scale is selected based on the size, shape, and material of the sample and other important factors which has an effect on the final result. The dwell time is usually of a few seconds, like 5seconds, chosen from the standard table. 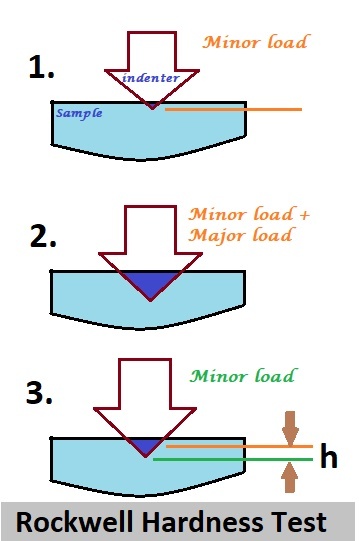 When the major load is removed (minor load still acting) the sample regains elastically and stop at a height 'h' that is shown below in the diagram. Where N is a constant selected from standard tables specific to hardness scales that are used in the experiment. It is easier to perform than any other type of tests. The results are more accurate than in other machines. It takes less time -Quick. The sample can be used after the test. The machine can test metals as well as some plastics. It is not suitable for thin materials. 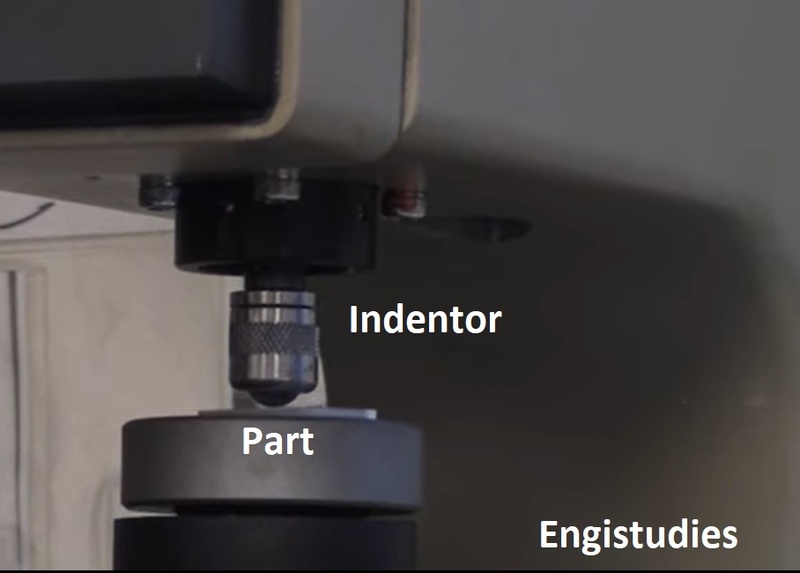 Accuracy is low for softer materials as the test totally depends on the impression of the indenter. This is quick and easy to perform. The diameter of the impression is measured. Comparatively small loads are used. Approx 3000kgf loads are used in this method. It is a non-destructive method. The sample can be used after the test as a very small impression is produced. It is a destructive method. The produced impression is bigger than that produced by Rockwell. Material with a coarse surface gives errors. A material with a coarse or rough surface can be tested with accuracy. Hardness value is directly read on the scale.